So – let’s take a look at another Hermes 3000 70’s. Okay… So… following the Hermes 3000 that I was so excited about a couple of weeks ago, I purchased another 70’s era Hermes 3000 for a whopping – bank breaking $9.50. Which officially makes it 50 cents cheaper than my previous cheapest typewriter acquisition from ebay. Australian 50c coin – featuring our coat of arms. AKA: The big coin that busts up your wallet. 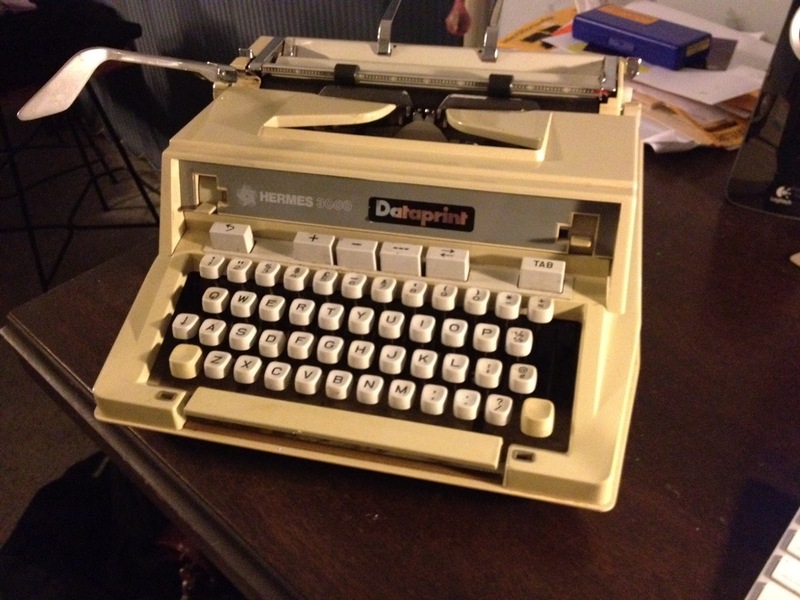 Again, I really didn’t need another typewriter, but as I couldn’t see myself using a QWERTZ keyboard regularly – and as I was so impressed with the feel of the previous unit, I felt a QWERTY unit would be… nice to have. And at $9.50 – why not. 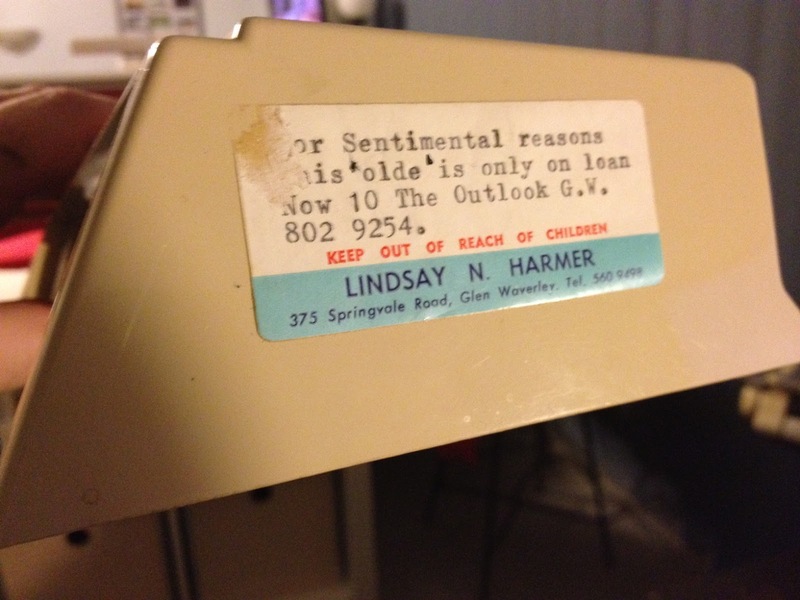 But typewriter geeks… That’s where the logic of this story ends. May I present to you – The hungarian made Hermes 3000. Where as the previous unit didn’t label it’s origin, this one sure does. While the serial number is only 200,000 units different, the quality of this typer feels quite varied. But firstly – let’s talk about what the seller described as a “perfect” typer. Hit the shift key and the basket locks down. Gummed up? Probably. The ribbon is drier than sandpaper, which is roughly the same way I would describe the texture of the platen. But it types. Or at least will once I shuffle in a new ribbon… and crank the shift key by hand. Having said that, I feel that every time I type – the family of dust-bunnies that are living inside this unit are being tormented by the hammering sound of the keys slapping the near rock-hard platen. It must be tough for them. I bet they have nightmares about someone writing poetry as they sleep at night. There’s the obligatory sticky key… D to be exact, but I get the feeling others are close to being home stuck bodies too. Which brings me to the next point – The sharp and accurate magic of the key presses of the other unit, just… well.. don’t seem to be here with this one. I don’t feel that tiny ratcheting so much, or the same quick movement that my other unit has. Some of the keys are perfect in action still, and do have the quite same feel. So I’m guessing that the problem could be dust and gunk in the segment. It’s not that it is bad. I just feels a bit more…. average. The ‘force’ is not strong with this one. Must have less midi-chlorians. WARNING: Midi-chlorians are copyright Lucasfilm 1999. And are also known as ‘The all time worst superfluous plot point in cinema history’. The plastic itself is quite sun affected, and as such has become something akin to that 80’s era computer beige. Further more – the smooth and silent operation of the carriage on the QWERTZ unit, isn’t quite so silent on this one; it ratchets – although somewhat quietly – when shifted. I can’t help but feel that this machine wasn’t made to quite the same quality standards as the other unit I purchased. It sure hasn’t been looked after as well. And it even has the ‘Dataprint’ sticker on it from the store that sold it here in Australia. So this doesn’t even have an interesting story behind it. Although… what’s this on the side? Another address label! This time, it is clearly a pharmacy label. These H3K owners seemed to really love labelling their typewriters. The label on this occasion has two addresses. One for the pharmacy business that the label came from, there other for – what I suspect is the owner’s address. The Owner’s house also appears to be currently for sale. Or was that the address that the typewriter was loaned to? The city that this address is located in, although it isn’t specified on the label – is Melbourne, my old home (and honestly quite missed) town. The Pharmacy is no longer there. It has been bulldozed to make way for a toyota dealership. Looking at the label, the phone number listed on it is pre-early 1990’s when Australian phone numbers changed from a 7 digit number, to an 8. Corrrrr…. $9.50. Really… I can’t believe it. June 5, 2012 in $9.50., 3000, glen waverly, Hermes, melbourne, project, typewriter. * You can try a concoction called retr0bright to try to bring the color back on the plastic. It looks like that requires a trip to a pharmacy and a sunny day. For a paltry $9.50, though, you can do just about anything to it and not feel guilty. My late Hermes is Hungarian and is smooth and has the quality you seem to speak of in your first Hermes. I think yours just lacks having been cared for. I bet you can clean it up and get it working quite well. Personally I suggest going for an older metal body Hermes even if it means saving up. They are much better constructed. I have every intention of painting it. I've been doing some research on plastic primers for the job, as I have a specific colour in mind. Should be fun! I have looked at the platen removal procedure, and I agree – I'd best approach it with a screwdriver in one hand, and a sword in the other. Currently fiercely bidding on a 50's model, which happens to be located in Melbourne. The seller doesn't want to post it – so has listed it as pick up only. So I might just have to get a family member to collect it. And you are right, this thing is full of yuck, which will probably clean out quite nicely. Having said that, I've been asking in the forums about people's experiences with soaking their typers. At $9.50 a typewriter, I've got not much to lose, and everything to gain. Hey Scott. What other “hobbies” can you have so much fun with for under $10? I reckon a typewriter is always worth a punt at that price – even if just for spares. Annnddd…thank you for making me smile with the Star Wars reference. If you cannot tell by the album below, I am a huge fan. Well for a set of spares, this is a pretty awesome set. I think this $9.50 has real potential. I've got it partially dismantled on my desk right now, while I'm working on it. It has jumped the projects queue. WHOA! Hey… I love Star Wars, and would put Empire in my top 10 most favourite all time films. But man, you show me how to collect! That's awesome gear! And I am absolutely in Awe of your R2D2 esky (I think they call them ice-boxes in the USA). Great stuff! I have never soaked one, so you will have to fill us in if you attempt it. Soaking a typewriter intimidates the heck out of me, but I have heard it can bring unbelievable results. Good luck at getting the metal Hermes. I call him R2-Beer-2, but generally we call them 'coolers'. Esky? Huh, never heard that one before. Funny how little things like that can be completely different. The novels are what really got me going with the series. The Darth Bane trilogy…my god, if you haven't read it please do. That, and the Thrawn trilogy. There are so many Star Wars books out there, it is hard to keep up. I haven't read any in a long while, as I became just overloaded after so many…starts to get old after fifty or so books in a row, you know? $1.00, $10.00 not a bank breaker. It will however buy some fun and a new typewriter in the typosphere. Myself as well as others, and I think you are finding, have had quite a bit of fun with very inexpensively priced machines. Those are the neat ones on which to learn. I have several Hermes 3000 typewriters, but I have stayed away from the plastic ones due to their reputation of being of cheap quality. Then as with all, some are noted to be very nice typers. I guess it is the same with the Swiss made metal ones. I have some in great shape that are ok typers and my last one that I bought for a parts machine is really the best typer out of the bunch.